My latest adventure book is Tabby and Cleo, Unexpected Friends, out now and available on Amazon. Cleo, a Bahamian boa, one of the misunderstood animals of the Bahamas, rescues Tabby, a Five-Finger Fairy. In trying to find Cleo a safe place to live, this unlikely pair help each other and the people they meet. Our latest book, Grow Home, Little Seeds!, tells the story of a bundle of seeds produced at the Leon Levy Preserve in the Bahamas, and their quest to find just the right place to grow. Wonderfully illustrated by Monique Carroll, the book includes a complete index of illustrations and descriptions of each of the special plants these seeds will become. Available on Amazon in paperback and Kindle format. Don't Make Me Rattle! is beautifully illustrated and contains facts and features about one of North America's most iconic residents: the rattlesnake! People fear rattlesnakes because they don’t understand them. Come inside and learn about these amazing snakes, how they help people, and why they should be respected, not exterminated. This book is now available on Amazon! A rattle from a reptile is not a welcome sound, but if it makes you tread carefully it's served its purpose, says Tucson author Elaine Powers. In a picture book chock-full of rattlesnake facts, she emphasizes the good they do (eating rodents, scattering seeds, and aiding cancer research) as she imparts interesting reptilian lore. For instance, although toxic to those on the receiving end, venom acts like saliva for a rattlesnake, a necessary digestive aid since they lack teeth for chewing. And rattlers are surprisingly social creatures who bunk together when it's cold-forming a 'rhumba' of rattlers. An unabashed rattlesnake fan, Powers bemoans how willingly we exterminate them, largely because they look so unlovable. She gets no argument here from illustrator Nicholas Thorpe, whose threatening rattlesnake pictures, some of them with mouths agape, dripping venom, are undeniably scary. This is the third in Powers''Don't' series of nature books for kids in grades K-4. This picture book for readers of all ages tells the humorous story of how the Sonoran Desert conspires against hummingbird photography.This colorful picture book for all ages teaches about the Sonoran Desert—with a sense of humor. It pits one bumbling human against the desert as he carelessly attempts to photograph an Anna’s Hummingbird. Enjoy the chase as the photographer is tripped up by a rock, stabbed by a Mesquite tree and rattled by a Western Diamondback. Then use the glossary to teach about the rich variety of life in the Sonoran Desert. Humor makes learning fun and easy! Now available on Amazon! A flooding river takes Clarissa Catfish to the Peoria Riverfront Museum. She thought exploring the Illinois River was exciting but once she is taken inside the museum, the real adventure begins. Clarissa explores the exhibits and makes new friends but will she escape the man who has dinner plans for her? Roadrunners run. Why don't they fly? Take a look in this book and you'll find out why. Now available from Amazon! "What a curious creature the roadrunner is! This iconic desert bird prefers hoofing it to flying, and its footprints are the same backwards as they are forwards. With vibrant illustrations by Nicholas Thorpe, this picture book is jam-packed with scientific facts about roadrunners, delivered in verse form to keep the narrative lively. Roadrunners "...grab their victim/behind its head/And bash it on/the ground until it is dead." Want to know how to swallow a horned lizard? Keep reading! This is the second offering in the "Don't" series by Tucson author Elaine A. Powers. The first is "Don't Call Me Turtle!" "Don't Make Me Fly!" is recommended for children in grades K-4." What happens to a booby that can't fly? Brian Brown Booby, a resident of Cayman Brac, finds himself stranded on a beach on Grand Cayman. The Brac is too far away for a booby to fly to, even if Brian could fly, which he can't. Will he make it back to the Brac? Fly Back to the Brac, Brian Brown Booby is the heartwarming true story of a young brown booby found on a beach on Grand Cayman. He was cared for by an animal rehabilitator and eventually learns to fly with others of his species. The book is available on Amazon. Silent Rocks highlights the damage caused by human activity to the iguanas on Cayman Brac. The book is now available on Amazon This book highlights the damaging effect of human behavior on the lives of native iguanas on Cayman Brac, an island in the Cayman Islands south of Cuba. Iguanas do not fare well in the face of human behavior, such as clearing land to build houses, leaving dangerous trash that accumulate in shallow waters, and paving roads that tempt the iguanas onto the warm pavement to bask, only to be maimed or killed by heedless drivers. The book encourages thoughtful awareness and action to help protect iguanas, and is suitable for all ages. Available now on Amazon in print and Kindle formats! Curtis Curly-tail, the perfectly-sized lizard from Warderick Wells, hears something noisy in the night. It's Horace Hutia and his family, crunching on leaves. Curtis Curly-tail meets Horace, an endangered Bahamian hutia, a new resident of Warderick Wells. The colony of hutias are damaging the cay's ecosystem. Scientists arrive to help, but what will happen to Horace? This book has several endings with different ways to solve the problem. The reader decides which ending would help the hutias most. Available now in paperback or Kindle format at Amazon! Tortoises are not turtles, for so many reasons. Learn these important differences and many interesting facts about tortoises, who live in the desert, and turtles, who love the water. NEW! Don't Call Me Turtle! is available for purchase by bookstores from Ingram Spark! while individual purchases can be made on Amazon in print and Kindle formats! Recent Review of Don't Call Me Turtle! in the Arizona Daily Star: "To the casual observer, turtles and tortoises appear to share so many similarities that we often use the names “turtle” and “tortoise” interchangeably. But the fact is that they couldn’t be more different, says Elaine Powers, whose charming picture book employs clever rhymes and colorful illustrations to demonstrate why the two should never be confused. To begin with, while some turtles were built to paddle around in the water, she says, tortoises were not – throw a tortoise in the water, and he’ll drown. And that’s just the beginning of her lesson about these special — and very distinctive — reptiles, a lesson sure to fascinate junior naturalists and animal lovers." Based on the true experiences of the author's visits to the Bahamas. 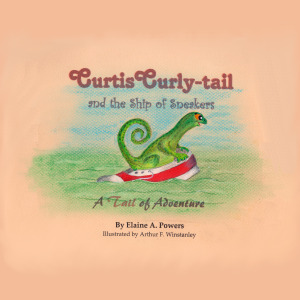 Curtis Curly-tail Now Available in French and Spanish!